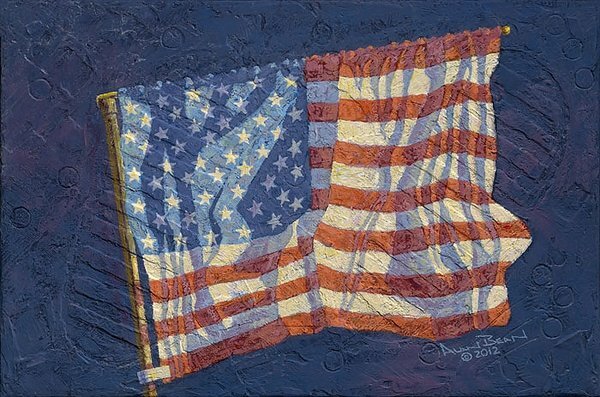 This Fine Art Textured Canvas is a portrait of the flag that Astronaut Neil Armstrong planted on the moon during the Apollo 11 mission, the first time man walked on the moon. The first flag hangs, much like a curtain, from a small extendable metal rod that Armstrong rotated up and locked in place at the top of the flagstaff. During the flight to the moon, the flag was stored folded-up, accordion-style, and attached to the flagstaff and curtain rod. During the first moonwalk, Armstrong and Buzz Aldrin attempted to extend the rod and flag to its full length but without complete success. 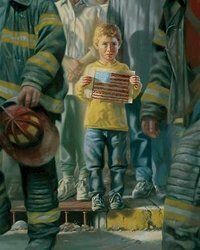 The creases in the shortened flag are still visible in my painting. A Fine Art Textured Canvas looks nearly identical to the original painting and reproduces Alan Bean’s carefully built three-dimensional canvas. Prior to painting this image, Bean covered the surface with a texturing material. He then used exact replicas of his Moon boots to make footprints across this surface to replicate the Apollo boot prints remaining on the moon today. Next, he used the Apollo 12 geology hammer, which he worked with on the Apollo 12 mission, to dig into the painting’s surface. Finally, a sharp-edged bit from one of the core tubes was used to make round indentations in the surface. All of this texture comes to amazing 3-dimensional life in this striking Fine Art Textured Canvas Edition. The Greenwich Workshop’s reputation has been built on our exacting standards and First Flag is as exacting a Fine Art Edition as possible. Each canvas is signed by legendary Apollo 12 astronaut, moonwalker and artist Captain Alan Bean and each is a work of art and a historic document. Own a personal and patriotic connection to traveling in space. Own a Fine Art Textured Canvas by astronaut and explorer Alan Bean and you will never look at the Moon the same way again. In less than seven years, on July 20, 1969, the whole world watched on television as Neil Armstrong and Buzz Aldrin unfurled the first flag on the moon. It was a moment that will live in history forever and in the collective memories of billions of humans 240,000 miles away on planet Earth.